When the dust from the daily news finally settles, the findings will go down in history. And February 11 2016 will be remembered as the day of gravitational waves and black holes. 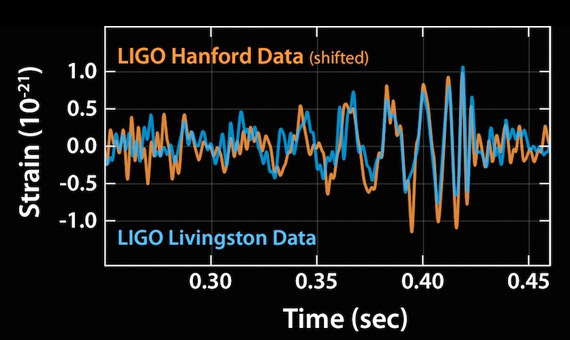 Figure 1: The two oscillations observed in the LIGO detectors. The variations in the distances measured are less than the size of the nucleus of a hydrogen atom (courtesy of LIGO collaboration). In short, that day marked the announcement that LIGO (Laser Interferometer Gravitational-wave Observatory), an ultra-precise system of two detectors located on both sides of the United States, had detected the fusion of two massive black holes. This phenomenon lasted only 20 milliseconds, but in that time it produced as much energy as all the accessible stars in the universe, generating a gravitational wave pulse that we have been able to detect 1.3 billion years later. Figure 2: The gravitational waves generated by the two black holes orbiting around the common center of gravity in a two-dimensional representation. We can see how the texture of space, shown here with blue squares, is distorted as the wave passes through (courtesy of the BBC). In fact, this distortion of space produced two practically identical signals in the two instruments separated by thousands of kilometers by producing a variation of one in one thousand trillionths (one thousand million million million or 1/1021). Or in other words, a fraction of a proton, which is the nucleus of the hydrogen atom, the least massive of all the chemical elements. This finding can be classified as epic and was made possible thanks to the efforts of all the engineers and physicists who took part in the project –over one thousand people from 16 different countries. This was a resounding success for international collaboration, but particularly for the National Science Foundation in the US, which from the very beginning has staunchly believed in basic science and in the need to finance the quest for knowledge for its own sake. What is a gravitational wave and what does this discovery mean? Imagine a couple of synchronized swimmers motionless in a swimming pool. The surface of the swimming pool is flat, but when the couple begins their dance, ripples appear in the water, which grow in intensity and frequency the faster the dancers move around each other in their dance, and these waves spread to the edges of the pool. If the couple end up embracing and stop, eventually the ripples they created will cease. In the same way black holes, when they orbit rapidly around a common center of mass, cause the space around them to compress and elongate, and this wave is transmitted through space at a higher and higher frequency as they approach each other. When they finally merge, the movement stops and the gravitational pulse disappears. Another simile can be found in the world of sound, which is also transmitted like a wave. We hear because the air vibrates, because the molecules that form it collide with each other and transmit energy until it reaches us. A gravitational wave is a similar phenomenon, although the substrate is not material –because interstellar distances are essentially empty– but space itself, which, as we have said, can stretch and shrink. This phenomenon in fact opens up a new window, perhaps the last, for giving us access onto the universe. While in 1609 Galileo Galilei, among others, used the telescope to show us a diverse cosmos, thus defying the geocentric conventions and the status quo, now –without going quite that far– we have within our grasp a whole series of phenomena that can only be glimpsed by indirect evidence (as in the case of black holes), or by theoretical models that are difficult to validate. In addition, one of the last pieces in the description of space has been found and located, in that marvelous puzzle that is physical reality, a puzzle that began to be ordered 2,500 years ago in ancient Greece and to which we are now putting the final pieces. Gravitational waves are the last prediction in Albert Einstein’s general theory of relativity, formulated in 1915 and brilliantly verified with a solar eclipse four years later. However, Einstein thought they were so weak they would never be detected. They allow us to observe and analyze the universe in a different way, particularly in the case of highly energy-intensive events such as the mergers of supermassive objects (such as black holes, but also neutron stars), almost as far back as the Big Bang. The study of these phenomena will help us understand the working of gravity, one of the four fundamental forces in nature –the most evident but the least understood. Finally, this enhanced knowledge will supply one of the last pieces to complete the theory of everything, the great unification. In short, as we have already said, this is a success for theoretical physics, for engineering, for astrophysics and for international cooperation. A good model to emulate in these turbulent times.